Yesterday’s 300 pip move in the euro vs dollar came despite the weight of negative euro sentiment, all of which should by rights have buried the euro long ago. However, in these thin, febrile and volatile markets anything is possible and yesterday’s extreme move was a classic example of a market over reaction to mixed economic news in the US. Open interest has fallen but still remains heavily to the short side and as a result this sharp move upwards should be treated with extreme caution as our longer term outlook remains firmly bearish. 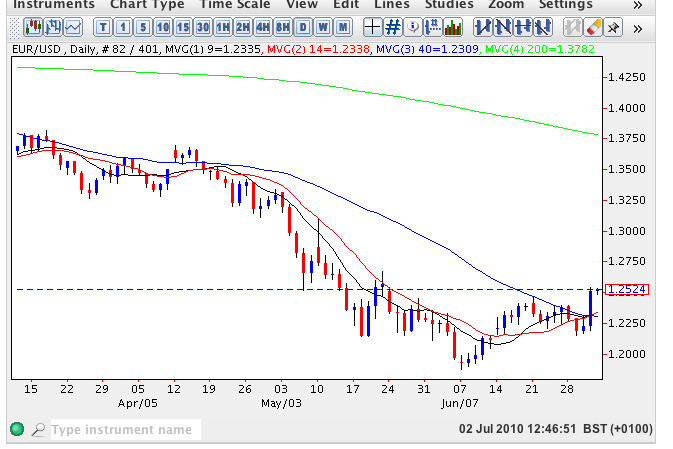 From a technical perspective yesterday’s wide spread up candle has pushed the euro vs dollar back above the three shorter term moving averages and closed marginally above the USD1.25 region as a result. Above sits an area of price congestion in the USD1.2585-USD1.2845 region and should this be breached then we may see the euro vs dollar push higher as a result. However, at some point in the next few days we may well see a shooting star pattern indicating a return of bearish sentiment and a move lower as a result. Today the markets are waiting for the non farm payroll data which is likely to come in much worse than forecast and under normal circumstances this should be positive for the US dollar but given that traditional market relationships and correlations appear to have broken down, quite frankly anything could happen, and probably will.